A dental implant is a modern way of replacing missing teeth. It takes the form of a titanium post that fixes into your jawbone and is topped by an artificial tooth. The crown of your dental implant will be almost indistinguishable from the rest of your teeth, and will work like a normal tooth – making implants a very attractive, long-term solution. The process can take between two and six months, as the crown is fitted once the titanium post has integrated with the jawbone. Dental implants are generally carried out by private cosmetic dentists, and are rarely offered on the NHS. Anyone with healthy teeth and gums can have an implant fitted. Dental implants offer a modern way to replace missing teeth, with a long-term solution that is as close to your natural teeth as possible. But what exactly is a dental implant? :- Essentially, it is a routine dentistry procedure to replace the full structure of a natural tooth. Whereas a denture or crown will fill the gap left by missing teeth, a tooth implant replaces the full root portion of the tooth and is fitted directly to your jawbone, making for a longer lasting, more functional and aesthetically pleasing solution. Millions of patients worldwide have successfully had dental implants fitted. To have an implant and be considered for false teeth, it is important that your teeth and gums are healthy. If there are any other problems, these will need to be treated first. Given the nature of the procedure, you need to have healthy bone in your jaw in order for the implants to successfully fuse and become strong enough to support the replacement tooth. If you smoke, suffer from diabetes, have advanced gum disease or certain other medical conditions (on which your dentist can advise) the procedure may not be for you. If you are eligible for an implant, it is highly recommended that you do not delay. Implants should ideally be fitted within one year of losing a tooth, as the jaw bone that surrounds a tooth immediately starts to shrink in size and eventually becomes so small that it will not support an implant. A dentist requires postgraduate training to perform implant dentistry. Always make sure you see a dentist with ample knowledge and experience for the treatment you require. Feel free to ask how many procedures they have carried out and if other patients who have had the procedure could share their experience. 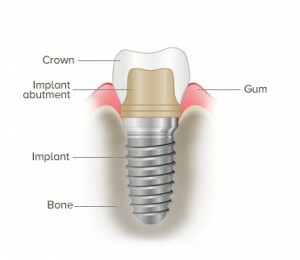 What are the benefits of having an implant? 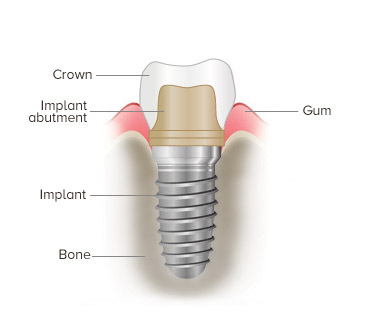 The replacement crown of your dental implant will be almost indistinguishable from the rest of your teeth. As dentures can come loose and a bridge may require a clasp to hold it in place, dental implants are the more long-term solution. Furthermore, once in place, as well as being aesthetically pleasing, dental implants are highly functional. Unlike dentures, which can be prone to moving about, teeth attached to an implant work like natural teeth. This means there will be no issues with speech and no discomfort eating harder foods that you might experience with normal dentures. Another major medical advantage of this form of cosmetic dentistry is that implants put a stop to bone loss. Over time missing teeth can cause atrophy (loss of bone) in the jaw, which may eventually alter the appearance of the face as the area around the mouth starts to sag. Dental implants can actually improve your bone structure by simulating growth. This can radically reduce the ageing effect missing teeth can have on your appearance. Implants are perfectly safe and there is no need to worry about the procedure. Though the treatment is advanced, it is also very well established and performed frequently. A tooth implant takes the form of an artificial root – a titanium post that fixes into a space created in in your jawbone. Once the post is in place it will take between two to six months for the implant to integrate with the jawbone, at which point your dentist will ask you to come back so that the teeth can be fitted. A connector called an abutment is attached to the post to hold the false tooth in place. You can have any number of teeth replaced with implants, from individually missing teeth to a complete set. If the missing teeth are next to each other, you may find that two or more implants may be able to support more than one tooth each, similar to a bridge. Is it painful to have a dental implant fitted? As dental implants are usually fitted under local anaesthetic you will not feel any pain during the procedure. It is quite common to experience some soreness in the following days however, but this pain can be controlled with regular anti-inflammatories that your dentist will prescribe. Dental implants aim to replicate the natural make up of a tooth and so, just as with the rest of your teeth, their durability will depend largely on how well they are maintained. If looked after properly, a dental implant should last for a good many years. That said, they do not come with a lifetime guarantee and neglect can lead to the same problems you might experience with any other tooth. Cleaning implants requires the same level of dental hygiene as natural teeth, although there may be areas that you could find difficult to reach. Some find that they may need to take more frequent visits to the hygienist to ensure their upkeep. Having dental implants fitted is a multi-staged process and, covering everything from the initial procedure to fit the titanium post, down to the actual crowns, each dental implant will cost between £1,200-£3,500 depending on the exact nature of the work you require. A dentist will always provide a full written quote with a detailed explanation of the procedure before you consent to any treatment. Most people opt for low or zero interest finance that many practices offer to help with the costs. Due to the high success rate, they are better long-term investments than paying to replace dentures or bridges.